I love Jamie McGuire. I mean, really, really love her writing. I have read all of her books, including The Providence Series, which is her other paranormal romance. One click if you haven’t because it is definitely worth the money! Anyone that hasn’t been living under a rock for the last year knows about Beautiful Disaster and Walking Disaster and everyone knows Travis Maddox is awesome. But someone made him awesome, Jamie McGuire. So, when I heard she was writing a book about a zombie apocalypse I thought, yeah she can pull that off. And guess what? She totally did it! Red Hill is told from three alternating POV’s, Scarlet, Nathan and Miranda, which is really cool. Most only alternate between 2 main characters, but three adds a new element that I loved. It is easy to connect with the characters and it adds more interest when you are in multiple characters minds. The only problem with alternating POV’s is that not all authors can do it well. Ms. McGuire, however, is flawless in her storytelling and writing style. You are hooked from page one. I am not a fan of The Walking Dead. Its not that I don’t want to watch it but the DVR is full already from all my other paranormal shows (Klaus and Damon anyone!). I wasn’t really sure what to expect from a zombie book. I mean, I was scared that Twilight would give me nightmares! I am a little bit of a wuss. 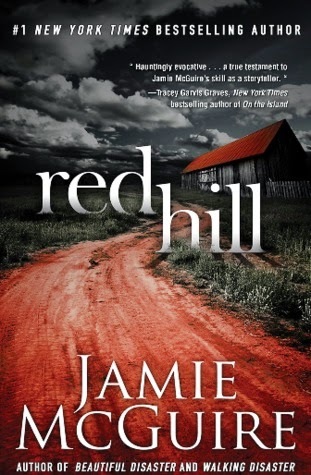 Red Hill, while a zombie book, was not so horribly graphic and full of violence that I couldn’t read it. The zombies and violence are not the main focus but the survival of the characters instead. Overall, I felt the novel was a great read and think that most readers will enjoy it. If however, you are looking for a pure romance novel this one might not be for you. Jamie McGuire is an amazing author! Now if I can just hold one til the release of Beautiful Oblivion all will be right in the world again!